We were asked by this dance company if we would be interested in having a dance performance from them, after they visited us last year. 'Blooming Heck!' is a light hearted, quirky and accessible dance piece by Julia Thorneycroft Dancers who are themselves in their 60's & 70's. The event included interactive sections with opportunities for gentle movement and dance. 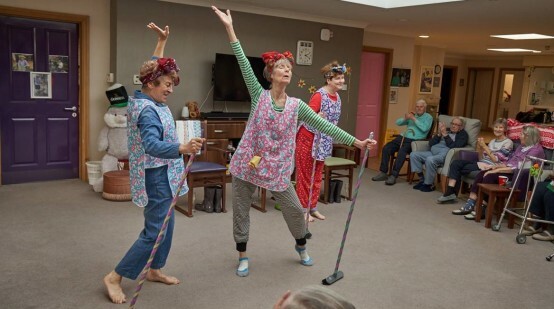 Thanks to Arts Council Funding Julia Thorneycroft Dance is able to offer free performances to older people's care settings in and around Bristol - so we said yes please and they arrived one Saturday afternoon and lit up the room with their enthusiasm and spirits.